Apparently that quotation about "Do one thing every day that scares you" is a misattribution to Eleanor Roosevelt, if I'm to believe a cursory internet search. Anyway, I was nervous, but I did it. I had one of the students who sits in the back row take photos. 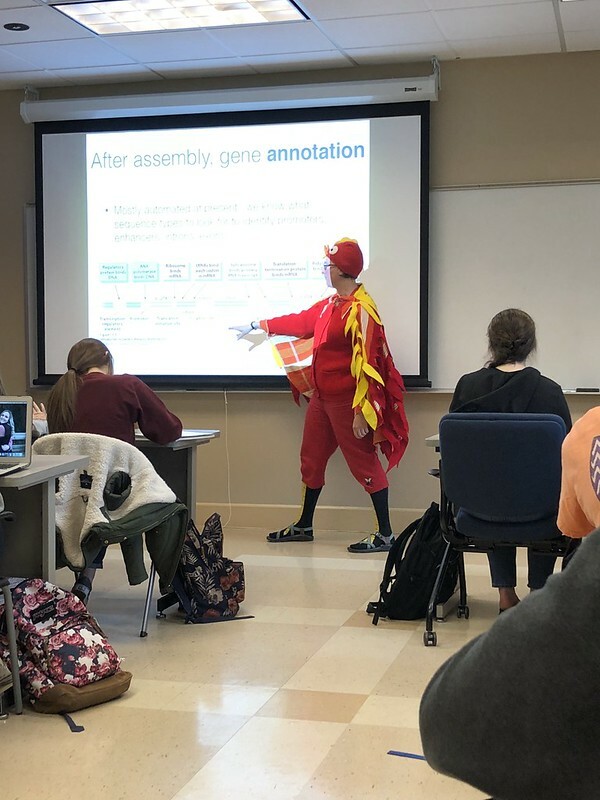 The students I asked said they thought it wouldn't be too distracting if I kept the wings on, so I did. The absolute best part was seeing everyone's facial expression as they walked in the door at the start of class. 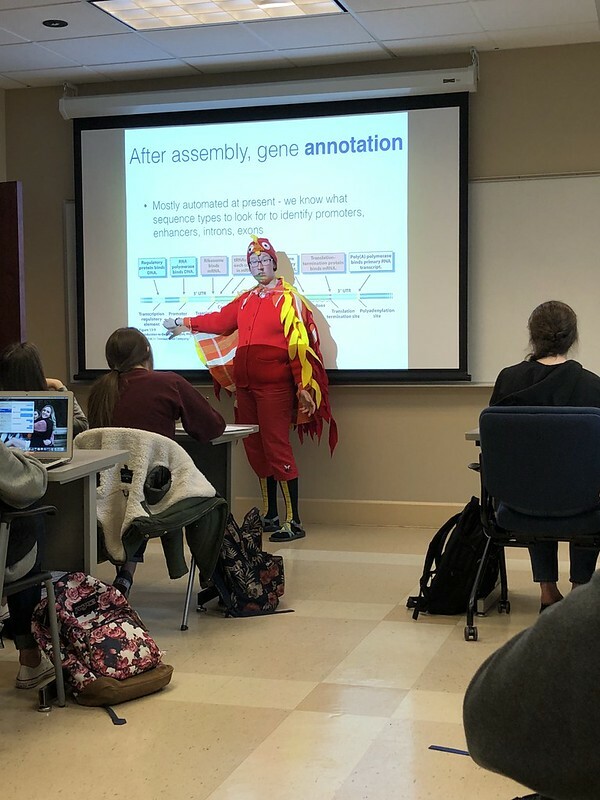 I only wore the wings on the bike ride to campus this morning, but I'll wear the full costume on my ride home (minus the chicken hat - helmet instead). No one wears costumes to my work...too many restrictions on how we can change our appearance...too bad. I teach in this room immediately after one of my colleagues. When I came in, all costumed up, he said he would never have the courage to dress in costume, but that at at least one of our other colleagues in the department has done so in the past. Hopefully this all means that my costume is an extra surprise and delight to people, and not, you know, "unprofessional." You could wear a costume that doesn't make your face hard to recognize. We wear badges and need then to be in buildings, and while everyone knows each out here without needing the badge, rules are rules. So no masks or costume makeup or enormous hats. Well, and nothing resembling a weapon. The chicken would be fine, I would think. Just nobody really bothers. I felt likes I was taking a chance with my plover hat at the stakeholder meeting last year, but people loved it. Anything that breaks up monotony and gives people a reason to chuckleb is probably welcome. That is marvelous and would instantly endear you to me if you were my professor. I think it's great. You are ridiculous, awesome, and ridiculously awesome. I love this. It is a great costume.